FOOD & RESTAURANT REVIEWS. — EAT. SLEEP. DISCOVER. The Mantis Shrimp: Ugly Sea-Bug or Delicious Dinner? The Mantis Shrimp. Cute, right? If you’ve ever walked through a food market in Asia, then you’re well aware of the vast variety of fresh seafood options. You’ve got the usual crustaceans like shrimp, lobster, fish, crab; and although they happen to be seven times larger than what you’re used to back home, they’re still familiar. Then there’s the other stuff: blood cockles, sea snails, giant clams, and various other slimy, alien-like creatures. If you're not prepared, it can all be a little off-putting trying to come to terms with the concept that people actually go out of their way to eat all of these wacky water treats. And honestly, a decade ago I would have hastily agreed! But not these days! In fact, now I make a point to seek out the most unusual delicacies wherever I go. It has become a fun hobby of mine to search the menu for something I've never tried -- or better yet, never heard of. These grotesque underwater crawlers look like a lot of things, but tasty isn’t the first that comes to mind. They've got a tough exterior: an armoured body, slender yet rugged; not unlike something you'd find in a gory alien movie, except shrunken down to about 6-12 inches in length. Adorning their armour are a multitude of legs: long ones for momentum, short ones for direction, and itty-bitty swimmer ones that never seem to take a break. But their energy seems to be concentrated on those little swimmers because the rest of them seems pretty lazy. But don't let that fool you! These little uglies are fierce warriors of the sea! There are two more legs/arms that I didn't mention. The Mantis Shrimp has a pair of spring-loaded boxing gloves that can bust up an oyster shell in one blow. These punches are so quick, in fact, that the water around them begins to boil. They've even been known to break through aquarium glass if they get big enough. So, they've got the fight and the armour to go with it. 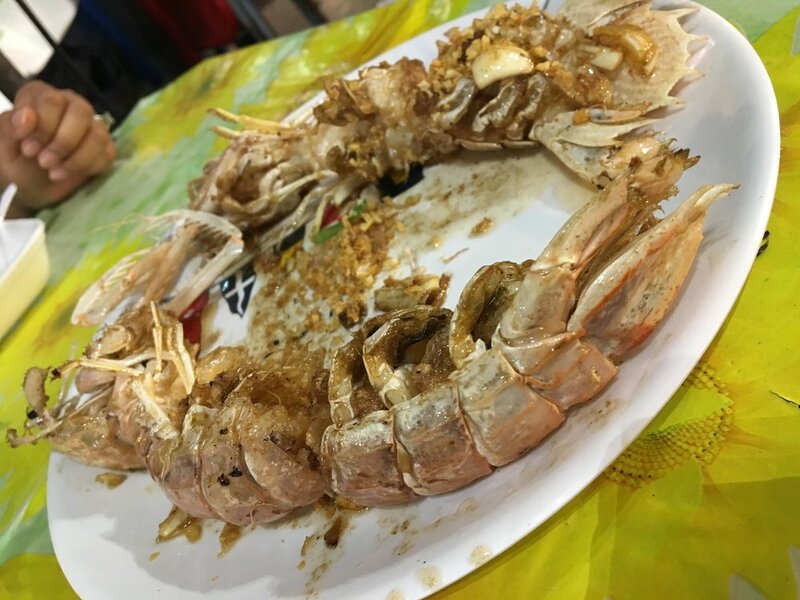 Like many foods in life, this one makes you wonder how hungry one must have been to be the first to fry up a Mantis Shrimp. Who the heck decided ingesting these deadly monsters was a good idea? And I'm sure that's what brought you here. You're probably wondering whether or not it is really safe to eat a Mantis Shrimp and furthermore, is it even worth it? They look prettier fried with garlic. This story doesn't end well for the Mantis Shrimp because these lil ocean-bullies are no match for a careful fisherman. And worse yet, not only are they as safe to eat as any other crustacean, but they're also succulent, moist, and delicious! Sorry, Mantis Shrimp... that's karma, I'm afraid. What goes around comes around. The first time we had them was in Thailand. We took a chance on them, pan-fried with garlic, and to our most pleasant surprise, it was SO WONDERFUL! Imagine combining the robust meatiness of a lobster with the delicate texture of a shrimp — that’s what these ugly sea-bugs are like. Alien never tasted so good. I highly recommend it.